Through the International Association of Ports and Harbors (IAPH) World Port Climate Initiative (WPCI), the world’s key ports have committed themselves to reduce greenhouse gas emissions while continuing their role as transportation and economic centres. As part of the effort to reduce greenhouse gas and air pollutants emissions in port areas, ports seek the cooperation of visiting vessels in order to address their exhaust emissions. In order to target that part, WPCI initiated in 2010 the Environmental Ship Index (ESI) project. ESI identifies seagoing ships that perform better in reducing air emissions than required by the current emission standards of the International Maritime Organization. The ESI formula evaluates the amount of nitrogen oxide (NOx) and sulphur oxide (SOx) that is emitted by a ship, while incorporating a reporting scheme on the greenhouse gas emissions of the ship and additionally rewarding ships that can use Onshore Power Supply while at berth. ESI scores range from 0 that indicates ship’s legal compliance with to 100 that indicates close to zero exhaust emissions. As such, the ESI score is a perfect indicator of the exhaust emissions’ performance of ocean going vessels and assists in identifying cleaner ships that proactively go beyond legal compliance. ESI is completely voluntary and WPCI hopes that the global port and maritime community will assume its role in improving the maritime and port environment. On a voluntary basis, ship owners register their vessels in the ESI database and their ESI score is calculated. 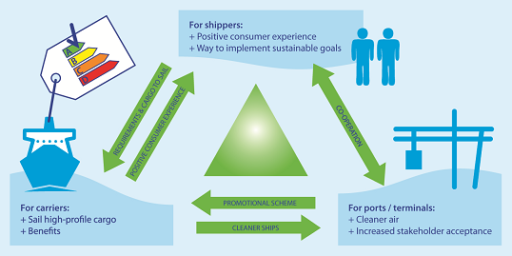 The index is then used by ports and other incentive providers to reward cleaner vessels (e.g. by offering discounts on their port dues on the basis of ESI scores) but can also be used by shippers and ship owners as their own promotional instrument. Currently, more than 7000 ships globally are registered in the ESI database and there are more than 50 organizations (the majority of which ports) that actively provide incentives to cleaner vessels on the basis of ESI. The ESI scores of the participating vessels and the types of incentives that are provided by each incentive provider are publicly available on the ESI website.